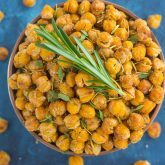 These Roasted Lemon Rosemary Chickpeas make a delicious snack or great addition to salads or soups. 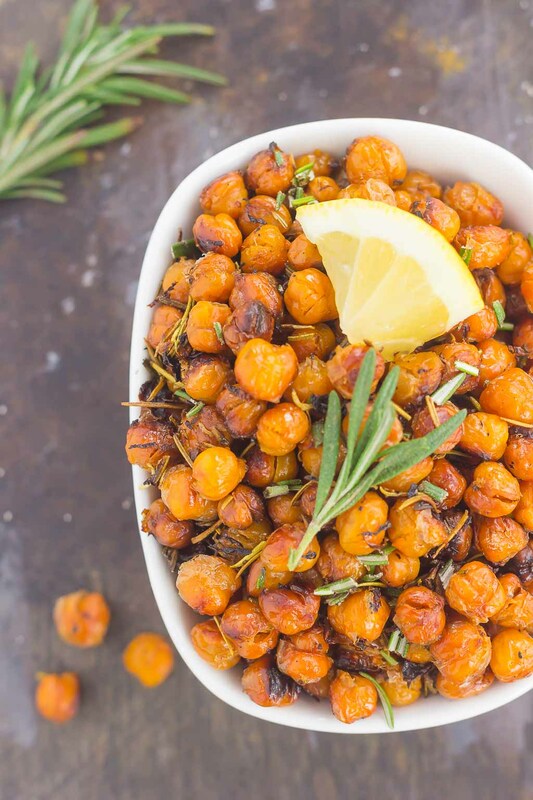 Packed with tangy lemon and fresh rosemary, these crunchy chickpeas are easy to make and perfect for when the munchies strike! When I was little, I wasn’t much of a snacker. And I certainly wasn’t the biggest fan of dessert. I know…you’re probably thinking who is this weird person?! 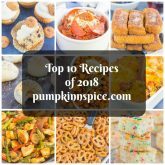 Not a snacker and passes up desserts? Craziness! Well, luckily, or maybe not-so luckily, depending on how you look at it, my eating habits have changed a little bit since I’ve gotten older. I liked desserts more than I used to (still not a huge fan of cakes with frosting, though) and I do love to snack. I think the snacking happened when I started working full-time on my blog. Since I work from home, my kitchen is such a tempting place! And when I’m in my office on my computer, the snack-attacks call me. I try to opt for healthier treats, such as yogurt, a handful of almonds, or fruit. But let’s face it, I’m not always the healthiest decision-maker. I’m trying to get better at that, and it’s a work in progress. So, I decided to make a list of healthy-ish snacks that I want to have on hand, just incase those craving strike. And that’s where these crunchy little bites come into play. If you’re like me and crave those afternoon or late night salty snacks, then these chickpeas were made for you. They’re vegan, gluten-free, and dairy free. Plus, with just a few simple ingredients, they’re ready in no time. How about that for a healthier snack? 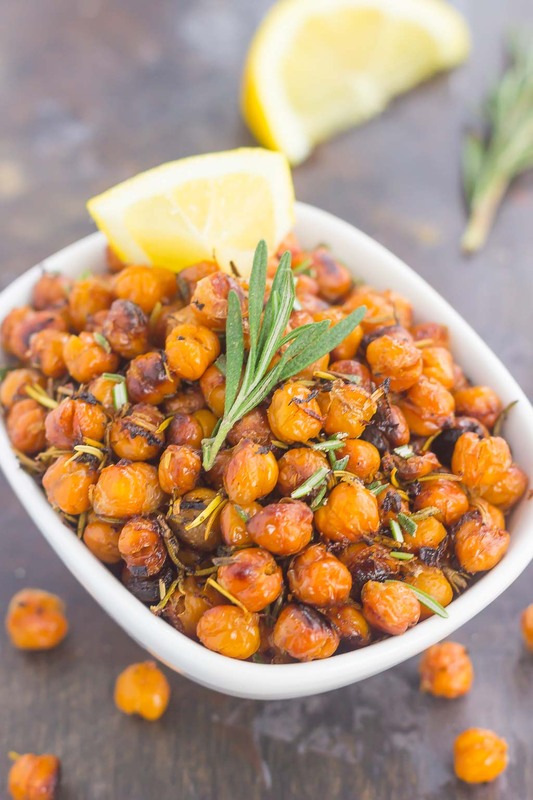 And just like these Roasted Parmesan Herb Chickpeas, I’ve been adding these Roasted Lemon Rosemary Chickpeas to just about anything I can. It makes a deliciously crunchy addition to salads (you can skip the croutons! ), a tasty topper to soups (especially creamy soups), and even a fun twist to chili or stews. But whatever you fancy, I guarantee you won’t be able to keep your hands off these roasted chickpeas. The lemon isn’t overpowering, and the rosemary gives it a subtle touch of flavor. 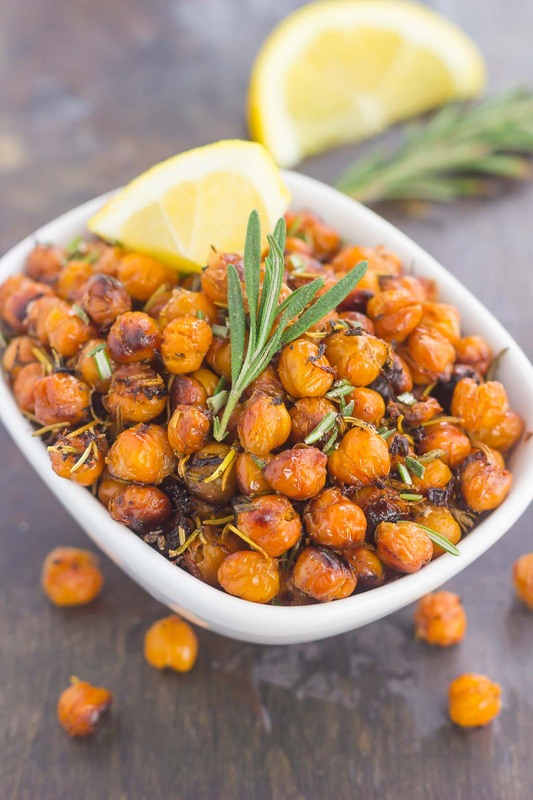 Crunchy, addicting, and loaded with flavor, these Roasted Lemon Rosemary Chickpeas will make a delicious addition to your snack routine! Using a colander, drain and rinse chickpeas. Spread them out on a counter or flat surface lined with paper towels and pat dry. I like to pat them dry several times and keep them on the counter for 10-15 minutes to dry. The drier your chickpeas, the crispier they will become when baked. I also like to remove some of the skins, as they will start to peel off when patted dry. But if you prefer to leave the skins on, they're just as good! Drizzle with olive oil and the juice of half of lemon and sprinkle with lemon zest, rosemary, salt, and pepper. Toss to coat and spread in an even layer. Remove from the oven and drizzle with the remaining half of lemon juice. It's funny how tastes change as you get older. I've always loved snacking however, and I love healthier snacks so I don't feel bad about it. 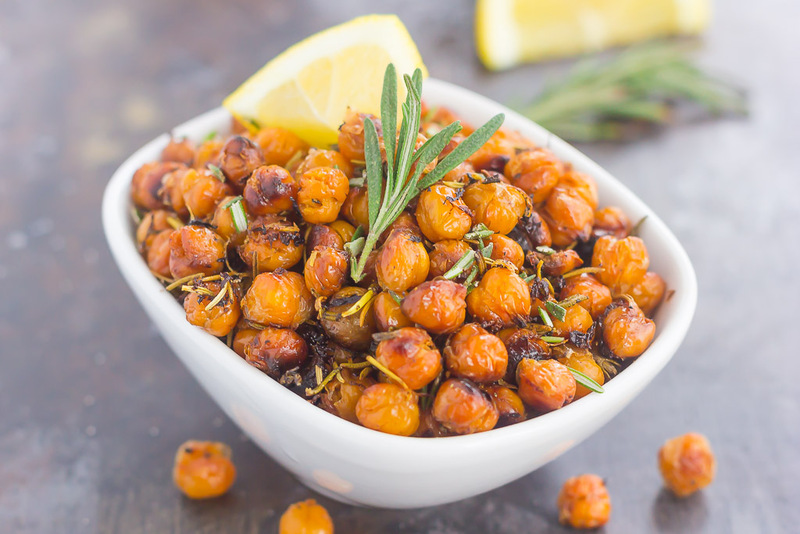 Crispy chickpeas are a favorite here and I love the lemon rosemary combination. These wouldn't last long over here! Thank you, Marcie! Healthier snacks are definitely the way to go! these sound so tasty! I really need some healthy snacks in my life! I'm always in for healthier snacks! These chickpeas look awesome! I'll definitely try them! Thanks, Mira! They're perfect to munch on! I'm the opposite -- I've ALWAYS been a snacker and a dessert-lover! 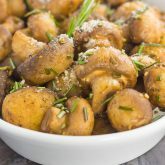 :) These healthy little bites look absolutely perfect for the munchies, and since I just bought a big case of garbanzo beans at Costco, I've got plenty on hand. 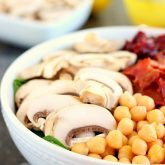 Sounds like you love chickpeas as much as I do! Thanks, Blair!